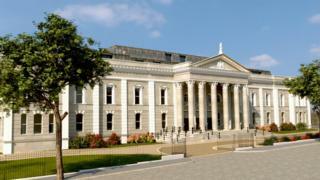 Plans for a hotel project at the Crumlin Road courthouse in north Belfast have been approved by Belfast City Council. The courthouse was bought by a Liverpool-based developer called Lawrence Kenwright of Signature Living. It is part of his plans to develop a number of hotels in Belfast city centre. He already owns four hotels in Liverpool. The courthouse is one of Northern Ireland's best-known listed buildings and was built in 1850. It closed in 1998 after nearly 150 years of use and has been derelict for 15 years and is in a state of serious disrepair. According to the planning application, the main courtroom would be retained and restored because of its historical interest. The company says it is seeking funding from the Heritage Lottery Fund for the restoration of courtroom number one.